REAL KALKI PURANA BOOK. In ancient times, in Shiva loka, Lord Shiva informed Parvathi Devi about Kalki Avatar. Original Sanskrit Palm Leaves were written by great sages Agastya and Vishvamitra. Aadi Tamil translation is known as Nadi Palm Leaves. Is this the right time for Kalki incarnation or has Lord Vishnu incarnated as Kalki in India now? The right and authorized answer for this question can be given only by the Supreme Organizing Authority (Sarvadhikari) and Supreme Preceptor (Param Guru) Lord Shiva, Self independent empowered eternal divinity (Swayamboo Chaithanya), existing in the light form in Shiva loka (one of the most important Celestial sphere -Jyothirgola). Human body and other living creatures on earth are made of the five elements (Panchabhoothatmaka shareeram). But in Jyothirgola or Jyothirmandala like Shiva loka, Brahma loka and Vishnu loka are in the Light Form (Prakashaswaroopa) and not made of the five elements. Vaitheeswaran Koil in Tamil Nadu, India is the storing centre of ancient Nadi Palm Leaves which is the Aadi Tamil translation of original Sanskrit by great Sages like Agatsya, Koushika etc. it is the scientific way to know whether you are included or not in the special list of devotees by the Supreme Organizing Authority and Supreme Preceptor Lord Shiva. The divine words of Lord Shiva (ShivaDeva) exist as historical evidences to prove that the phenomenons of universe are not incidentally happening but by pre-planned execution. Are you included in the special list of devotees to Lords (Devankal) beyond caste and religion ? Is your worship acceptable to Lords? Tanjavur King Sharabhoji II had created many divisions in Nadi palm leaves, such as Maha Shiva Nadi, Agastya Nadi, Koushika Nadi, Vasishta Nadi, Bhrigu Nadi, Bhokar Nadi etc. Mahashiva Nadi palm leaves are the divine conversation of Lord Shiva and Parvathi Devi. Also there are many special chapters in Maha Shiva Nadi Palm Leaves – Maha Shiva Nadi Sukshal Sukshma (Devarahasya Kandam or Divine Secret Chapter), Thulliam, Sukshma, Gnana Aashi, Pothuvinsevai (Political) Chapters etc. Other Nadi Palm Leaves are in the name of Sages like Agastya Nadi, Koushika Nadi, Vasishta Nadi etc. Sage Vishvamitra was also known as Koushika. These are the historical evidences with clear, solid and correct informations about several persons born in this age with correct details such as name, date of birth, star, parents name, siblings (if any), profession, present life status and problems, future, past birth, spirituality etc. Here is giving the important Aadi Tamil stanzas from ancient Maha Shiva Nadi Palm Leaves Koushika Nadi both contain divine conversation of Lord Shiva and Parvathi Devi about Kalki written by Agastya and divine words of Sage Koushika (Vishvamitra) respectively. English prose translation is also given here. Maha Shiva Nadi Sukshmal Sukshmam (Devarahasya Kandam), Thulliam, Sukshmam, Gnana Aashi, Pothuvinsevai (Political) are the various special chapters of Kalki. The correct details of name, date of birth, star, planetary position, parents name, caste and religion and age when the leaf is read with specific explanation of the great previous incarnations are clearly described in these chapters. These Nadi Palm Leaves were read between 12.02.2004 and 26.03.2005 respectively. Another important Maha Shiva Nadi Political chapter Palm Leaves of Kalki was read on 4th July 2013. Original Sanskrit palm leaves are not available now. Aadi Tamil translation is known as Nadi Palm Leaves. Shelvanivan Iraipiravi (10):5:2:1,2 MukthiRekhai (9):5:1:3. Umayavalum Enthanayum Arintavan Nee (1):6:4. Note: (1):14:2:1,2,3 which means (1):=chapter in the book, 14:=stanza number, 2:= line in a stanza, 1,2,3:=words in a line. If there is a number in a bracket among the numbers given for words in a line, then that number in the bracket indicates the particular part (either the first part or the second part) of the word among the three words in a line. i.e. Ithanal ShivanMainthan Gnanamthannil (9):11:1:1(2),2,3. Inamaanu=as all these, Devi=Parvathi Devi, yan=I, Deviyan= I Parvathi Devi, Vanankiketpen=enquires with humble worship, Embiduveer=please inform me, Nam Mainthan=our son, Nam=our, Mainthan=son, Rahasyaththe=divine secrecies, Rahasyaththe Sukshmamaay=minute divine secrecies (Sukshmal Sukshmam chapter), Arulveer Naadha =Lord! Please inform. Parvathi Devi offers humble prayers to Lord Shiva and requests Him to inform the complete details with divine secrecies of previous incarnations and the importance of this incarnation of Our Son [ NamMainthan (1):2:4:2 ]. Lord Shiva accepts the request of Parvathi Devi and reveals the divine secrecies of Kalki. Ihaparathil=in this world, Shenithathume=born, Bhagyankal=(people) is great fortune. His birth is a great fortune to the world. Lord Shiva said to Parvathi Devi. Virodhikrithu Aandathile=Tamil year: Virodhikrithu (Malayalam year: 1147. English year: 1971), Thelinthinkal=Karthikai month (Thel) in Tamil year (Vrishchikam in Malayalam. November-December in English), thinkal=month, Irubanyen=28 (December 14), Sheyinvaram=Tuesday, Swathi Meen=star: Swathi (Chothi-15th Lunar asterism), Meen=star, MudiKaviVillu=Venus is in Sagittarius, the Ascendant (Lagna), Mudi= Ascendant (Lagna), Kavi=Venus, Villu=Sagittarius. Date of birth: 14th December 1971. (as per Tamil calendar: 28th of Thel Month in Virodhikrithu Year and in Malayalam calendar: 28th Vrishchikam, 1147). Star: Swathi (Chothi- 15th Lunar asterism). Venus is in Sagittarius, the Ascendant (Lagna). Lord Shiva informed Parvathi Devi. Education was obstructed while doing graduation. Lord Shiva said to Parvathi Devi. His birth is for divine mission. Lord Shiva said to Parvathi Devi. Mukthi Rekhai=name of the thumb impression, Sirappane=much specialities, PulliNavam=has nine dots. The thumb impression of Kalki has specially powerful and rarely seen nine dots called Mukthi Rekhai. Lord Shiva said to Parvathi Devi. Religion and caste: Hindu Brahmin. Lord Shiva said to Parvathi Devi. In another chapter, Agasthya Maha Shiva Nadi Sukshmam Pothuvai Kandam of Kalki, Lord Shiva informed another name for the same special and powerful nine dots in the thumb impression of Kalki as “Keetru Rekhai” [“Mevidave Kalashavari Keetrurekhai (10):3:3. Menmaitharum Navapulli’’ (10):3:4:1,2.]. Ithanaal=now, Shivan Mainthan=son of Lord Shiva, Gnanamthannil=in spirituality. Now My Son (Shivan Mainthan) is in spirituality. Lord Shiva said to Parvathi Devi. Ivanthanakku=his, Gopakumar Namamkandu=name was Gopakumar, Kandupin=after that, Akhilananda Swamiyaki=became Akhilananda Swamy, Kooridave=that being informed, innaal=at this time, Dashamavatharam Kalki= Dashamavatharam Kalki (10th incarnation of Lord Vishnu), Pooriduver=while this is informed, Ithukalathil=at this time, Kalki Bhagavan=Lord Kalki. The previous name Gopakumar and Akhilananda Swamy were changed and the present name is Kalki. Lord Shiva said to Parvathi Devi. While reading this Nadi Palm Leaves, He is Kalki Bhagavan (Lord Kalki). Lord Shiva said to Parvathi Devi. Position: Dashamavatharam (10th incarnation of Lord Vishnu). Lord Shiva said to Parvathi Devi. Here, Lord Shiva gives the present name with two previous names which is the most significant evidence for identifying this Nadi Palm Leaves. Generally, in Nadi Palm Leaves only one name is mentioned. But in this special and important Nadi Palm Leaves of Kalki, Lord Shiva establishes it with historically proved evidences. The name Gopakumar given by parents is documented in the school certificate, also the name Akhilananda swamy and Kalki are documented in the Kerala Gazette (6th July 1999 and 11th Jan 2000 respectively). Later, these three names were proved historically in ancient Nadi Palm Leaves read in 2004 with the clarification of present name as Kalki. The two previous names of Kalki were real and not pet names, when used. Usually, people have pet names, but these are not official. Nadi Palm Leaves are found in bundles. In a bundle, there are details of about hundreds of people. Among those, the three names of Kalki are the scientific proof to identify the original Nadi Palm Leaves. So, Nadi Palm Leaves of Kalki are not a prediction, but the science to prove the history of incarnation, reincarnation, birth, rebirth and the pre-planned executions of this Universe. Kalki has come to remove the ignorance. Lord Shiva said. Grace and the greatness of Kalki incarnation will become famous by My divine words. Lord Shiva informed Parvathi Devi. Umayavalum=Parvathi Devi, Enthanayum=Me (Lord Shiva), Arinthavan Nee=You (Kalki) have realized, Arinthavane=You who has realized, Paripoorana=complete, Aashiyundu=have blessings. Kalki realized Me and Parvathi Devi with our complete blessings. Lord Shiva informed Parvathi Devi. Padaiththittan=exists, Malavanum=Lord Vishnu, UnakkulEppom=now (always) inside You (Kalki), Unakkulle=inside You (Kalki), NanErukken DeviKoode=Me (Lord Shiva) and Parvathi Devi exists in You (Kalki). Lord Vishnu with Me and Parvathi Devi are existing in You (Kalki). Lord Shiva informed directly to Kalki through these words “inside You- Unakkul and Unakkulle“. Seerkovilum=own temple, UndithuNaal=now has, Varumulakil=in coming years in the world, Unkovil=your temple (Kalkipuri Temple), Ulakam kakkum=will protect the world, Ethukurai=sufficient, Koviludane Bhaktharmecha=very soon the (Kalkipuri) temple will prosper with devotees, Siranthonkum=in a specially increased rate, Aalayamum=in the great temple (Kalkipuri Temple), Sevaimelaay=great help, Mechumpadi=with prosperity, Amaithithadam=in a calm place, Giriyinpakkam=on the hill top, Sheelamudan=divine, Thuvakkangal Niraivumnantraay=begin in a good mannner and will be completed. Kalki has a great temple (Kalkipuri Temple). The world will be protected by Your Temple-Kalkipuri Temple [Varumulakil Unkovil Ulakamkakkum (8):4:2.]. Kalkipuri will become famous and devotees will also increase. 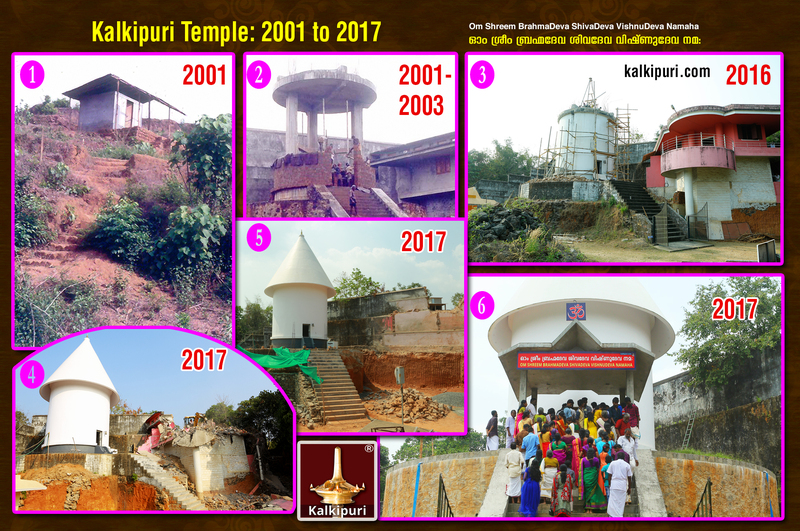 The great temple (Kalkipuri Temple) situated on the hill top in a calm and peaceful atmosphere (in the birth place) will become famous and attain prosperity by sincere services of all devotees especially those at higher positions. Lord Shiva said to Parvathi Devi. Kalki exists in oneness beyond caste and religion. Lord Shiva said to Parvathi Devi. Ithanmunnam=before this, Kiruttinanaay=as Lord Sree Krishna (8th incarnation of Lord Vishnu), Avatarithaay=incarnated, Paahupada=without difference, Palaleelai=different kinds of divine plays, Sheithumelaay=that which was performed several times, Paarulakil=in the world, Ariyaathor=which everyone knows, Undusholven=is being read. Previously, Kalki incarnated as Sree Krishna (8th incarnation of Lord vishnu) and executed several moral divine activities which are still praised by devotees. Lord Shiva said to Parvathi Devi. Unduthaan Sukshmankal Oraipenippam=also there are several other minute divine secrecies like that is informed now. When Kalki was Sree Krishna, there were several divine secrecies. Lord Shiva informed Parvathi Devi. You have saved Droupadi (to be the wife of Arjuna only). Lord Shiva informed Parvathi Devi. When Kalki was Sree Krishna, He saved Droupadi to be the wife of Arjuna only, one of five Pandavas. Droupadi was also called as Panchali because she was the daughter of Drupada – the King of Panchala. Ganyamaay=sincerely with justice as per rules, Athanmunnai=before that, Manithanaay=as a human, Kadamaiyathu Maaraamal Irukkavendi=how to do the responsibilities regularly, Vendithaan=to inform, Sree Raman=as Sree Rama (7th incarnation of Lord Vishnu), Avataramkondu= incarnated, Vehumsirappai=especially, Arakkarkalai=evil forces, Maithavan Nee=you have killed, Kaanappin=along with that, Thaithanthai=to parents, Thunaikalkkum=to brothers and sisters, Ganyamaay=sincerely with justice as per rules, Ottrumayaay=with unity, Kadamaimaara=sincerely doing the duties, Maaraamal=without difference, Avarkaludan=along with them, Anbaaynintraay=with unity and acceptance, Makkalellaam=people, Purunthittar=informed, Amaithiyode=all that is needed for living in peace. Before Sree Krishna, Kalki incarnated as Sree Rama (7th incarnation of Lord Vishnu) for the fulfillment of real welfare rule. At that time, You have destructed evil forces and practically implemented the real welfare rule and proved how to do the duties and responsibilities between family members and people as per justice and morality with their position in the country. Lord Shiva informed. Before Sree Rama and after Sree Krishna, Kalki incarnated several times. Lord Shiva said to Parvathi Devi. Avataram Maalavanin=Lord Vishnu incarnated, Arulinaale=by the divine words, Arbhuthankil=miracles, Nihayilthave=by doing, Vivekanandan=as Swamy Vivekananda, Divyamaay Palasevai=different kinds of spiritual services, Gnanamshinthai=following the path of spirituality and wisdom, Kaalamathil=at that time, Naan Alaithen= I (Lord Shiva) called back, Athaninpinne=after that, Kalkiyenum Avataram Ithukalathil=incarnated as Kalki at this time. Lord Vishnu took birth as Swamy Vivekananda and did several moral activities related with spirituality and temple work. At that time, I called Him back. After that, now incarnated as Kalki. Lord Shiva said to Parvathi Devi. Vannamathaay=the good, Ramakrishna Sarada Eentror=Ramakrishna and Sarada are parents, Iruthunaikal Aan Pen=one brother and one sister, Manavum Kandaan=married, Kanduvarar=know that, Kadaisaayal=last son, Shinthai Melaay=great thinking power, Palamudane Nulayvum=with complete efficiency while reading the nadi palm leaves, Muppanshoolsarve=aged 33. Parents name is Ramakrishnan and Sarada. Two siblings, one brother and one sister, both of them are married. Kalki is very efficient and last born in the family. These Nadi Palm Leaves of Kalki are read at the age of thirty three. Lord Shiva said to Parvathi Devi. Parents and grandfather’s details about Kalki has specially mentioned here. In the Maha Shiva Nadi Sukshmam palm leaf of the father of Kalki, “Kulam Nantraay Mahanpirrappaay (3.2)” (born in a good community or Namboothiri community), ‘Tohukkatan Ramakirittinan Mahantanakk (5:2) (Son’s name is Ramakrishnan), “Kuraikka Damodaran Attanakk (5:3)” (Father’s name is Damodaran- Kizhakkumbatt Illath Damodaran Namboothirippad), “Kalyani AnnaiAval SaradaThaaram (5:4)” (Mother’s name is Kalyani. That means, the grandfather was in namboothiri caste (brahmin) and grandmother was in nair caste. Later, Kalki’s grandfather had married another namboothiri women and had children. Sarada is his wife’s name.) is also written in the Maha Shiva Nadi Sukshmam palm leaf of the mother of Kalki. “Kulamum Pinmel (2:1:3)” (Nair caste or the one next to Namboothiri community), “Koore Mahal Saradaave Entrusolle (7:4)” (the daughter is called as Sarada), “Sollathan cherunni Nairtaane(8:1)” (Father’s name is Cherunni Nair. It is noted that with the name of the father of Kalki’s mother, the name of the caste is also given), “(Sirrappudane Kalyani Annaikand(8:2)” (Mother’s name is Kalyani), “ Nallathoru Ramakiruttina Kaantanahe ((8:3)” (Husband is Ramakrishnan).These were also given to know whose palm leaf is being read. Lord Shiva informed about the caste and religion for the clarification of the social state of this period. It was not to approve comparatively the better one among the caste and religion. Before a period of a thousand years, Lord Shiva had informed including the name of caste and religion to clarify how would be the way of living of the people in the present period. In the Maha Shiva Nadi Divine Secrets chapter (Sukshmal Sukshma Kandom) of Kalki, Lord Shiva informed Parvathi Devi, “Shathimatham Kadanthuthaan Yehamentre(1):8:4. Yehamentre Vilankidume Karunayaale (1):9:1” (By My blessings, Kalki exists in Oneness beyond caste and religion) which means, Lord Shiva do not encourage caste and religion,but had clearly intimated about the existing heinous state. Also indicates here about the important duty to be executed in the mission of the 10th incarnation (Dashamavatar). Paark makan Mun Oozham=past birth of this son being informed, Paark=that which is being informed, makan=son, Mun Oozham=past birth, Vangadeyam=Vangadesham, previous name of Bengal, one of the state in India, Baalakanum=boy, Narendra Dutta=previous name of Swamy Vivekananda given by parents, Earperkandu=the correct name, Kandupin=after that, Vivekanandan=Swamy Vivekananda, Entrumari=changed to, Kaalai Guru Guru Patniyum Eentror Naamamaahi=the preceptor and wife of preceptor had the name of the parents of this birth (Sree Ramakrishna Paramahamsar and Sarada Devi), Vannamathaay=in a good way, Guruvazhiye=was in the path of the preceptor, Valamudane=in a good way, Valivirunthu Daanamkondu=by giving food, Palaelai=to many poor people, Udaviyathu=helped, Bhodhanaisheithu=by imparting knowledge for moral enlightenment, Balakanum=boy, Vazhnthittaan=living, Eraisevayodu-in divine service, Nalamudane Kandaalum=though in a good manner, Edaivittu=without completing, Naayakanum=Vivekananda, Sentrathanaal=since went back, Eethulthotram=this birth. The recent past birth of Kalki was in Bengal (Vangadeyam). At that time, born as Narendra Dutta, later changed the name to Vivekananda and the name of Preceptor (Guru) and His wife (Guru Patni) are same as that of the parents in this birth. Lord Shiva said to Parvathi Devi. (Sree Ramakrishna Paramahamsar and Sarada Devi were Guru and Guru Patni and the parents in the present birth are Ramakrishnan and Sarada. Thus the name is same. The word ‘Sree’ is used as salutation and Paramahamsa is not a name but it is considered as a spiritual stage. Here the word ‘Devi’ is used as an honourable salutation. Real Devi and Devan exist in Jyothirgolam or Jyothirmandalam- Lord Shiva and Parvathi Devi in Shiva loka, Lord Brahma and Saraswathi Devi in brahmaloka and Lord Vishnu and Lakshmi Devi in Vishnu loka in the light form (Prakashaswaroopa). Vivekananda was the follower of His Guru and executed several moral activities to attain integration and progression for the poor people. Vivekananda constructed the temple and morally awakened the nation by divine knowledge. While involved in the divine mission, Vivekananda returned without completing. Now again, Vivekananda has reincarnated as Kalki for the completion of the divine mission. Swamy Vivekananda is a historical person. His life and activities are proved in the history. Original Nadi Palm Leaves of Kalki was written in Sanskrit language in the ancient times. This is the world miracle! In the elaborated description of the previous incarnations of Kalki which is written in Nadi Palm Leaves proves that the names of Sree Rama, Sree Krishna and other incarnations are also included in the Indian history along with the name of Swamy Vivekananda. Sree Rama and Sree Krishna are not fictional characters. As per the ancient Nadi Palm Leaves of Kalki, mentioned above, it proves that Sree Rama and Sree Krishna are historical persons. Avatara Kalkiye=Kalki Avatar (10th incarnation of Lord Mahavishnu), VazhkaVazhka=long live! long live! Long Live! Kalki Avatar (10th incarnation of Lord Vishnu) Long Live! Lord Shiva informed Parvathi Devi. Divine conversation of Lord Shiva and Parvathi Devi about the duty of Kalki as Ruler to execute welfare nation. In ancient times, in Shiva loka, Lord Shiva informed Parvathi Devi, Kalki is the Ruler and will execute Welfare Nation, written in ancient Maha Shiva Nadi Political Chapter Palm Leaves (Arashial Kandom or Pothuvin Sevai Kandom) of Kalki by Agastya Maharshi, read on 4 July 2013. Nadi Reader: A. Sivasamy, S/o V.S. Arulsiva Arumugam at Vaitheeswarankoil, Tamil Nadu, India. Total stanzas: 22. Total lines: 88. Total words: 264. Nadi Reader Sri. A. Sivasamy, English translators: M. Parthasarathy and Hemalatha Selvaraj. This son is our blessed son and he will be able to visualize certain things in the form of celestial light. This son has obtained the blessings from Lord Almighty. Lord Shiva blesses this son to find success in the Political field and to carry out the public service successfully. This son should be guided in the proper way to carry out the Public service without any problems. Parvathi Devi says he is the good soul born on this earth to carry out the service to the people. This son will be able to manage the mankind easily. Lord Shiva will hand over the responsibilities to take care of Human beings. He is a special soul and he will guide the people properly by the direct guidence of Lord Shiva and Parvathi Devi. This son will be able to execute the Real Welfare Rule. He will find happiness and fulfillment. This soul has connectivity to Aadhi Shivan [Supreme Organizing Authority and Supreme Preceptor (ParamGuru) Lord Shiva, existing in Shivaloka]. This soul has come down on this earth by the gracious blessings of Lord Shiva to keep the people in this world happy and for all the good things to survive. He has come down on this earth with high responsibilities and to do good deeds to the people and to remove their sins and to keep the living beings in a good way. In this birth he has close connections with Lord Shiva. This son has come down on this earth at the right time to fulfill some responsibilities entrusted by Lord Shiva towards the people. This son has connection to Lord Shiva and Parvathi Devi. He has taken the births to do some good things whenever this world faces critical problems. He will guide the people to the right way. He will lead a happy and prosperous life. He has taken birth but he is not a normal human being. As a human he has horoscope, Rasi (zodiac), Lagna (Point of intersection) and parents. This is very important evidence. His zodiac is Libra. His name is Kalki. His parents are Ramakrishnan and Sarada. These are the evidences for tracing out the Political Chapter. Kalki already knows about his Political life, but again he is reading these predictions to find clarity in his Political proceedings. When Kalki informed the reading time of his political chapter to some devotees on 3rd July 2013 at Kalkipuri, they requested him to get it read. In that situation, he reached at the Nadi Office, Vaitheeswarankoil to read his Political Chapter. Kalki is referring the Political chapter not for his benefits. When Kalki exists in the Position of the Ruler he will execute the REAL WELFARE RULE which will help in uplifting the poor people in their life. This son is daily offering his prayers to Lord Almighty. Parvathi Devi says to Lord Shiva, Kalki is My blessed son and I myself want to tell him about his Political execution as the Ruler, so You may kindly bless Me. Kalki will have link in Politics and his reputations will increase. According to his desires he will be in the field of Politics. In the field of materialism, he is a Politician. But he is in spirituality. Both materialism and spiritualism are accomplished in him. He is a Politician and will execute the Real Welfare Rule but at the same time he is in spirituality. His Political services are the services to Lord Almighty. Even though the people might think that he is a Politician but his dedicated service will be in the line of spiritualism. Even though the people have the idea about this son to shine in the field of Politics, his decision is very much important. This son always thinks that through his powers he may be able to render his support to the people. Parvathi Devi says even though Kalki has obtained the blessings of Lord Shiva to carry out his works in the field of Politics, he should have the intention and decision for the implimentation and how long he intends he will be in the field of Politics. He will be entrusted with power in Politics and he will carry out his works successfully and the rest of the time he will spend in spiritualism. This son has already obtained the Grace of Lord Shiva with Parvathi Devi and Lord Mahavishnu. He will do many good deeds and charitable acts and he will lead a successful life. This son will be able to realize the Miracles that took place in his life in the past, and he will come to know in the present and future. Kalki will come to know the future happenings. This son will be able to realize the Miracles that took place in his previous life, and he will come to know in present and future. Kalki will come to know the future happenings. This son has different ideas and thoughts regarding the posting in Political field. At present he wants some clarity in his proceedings but he need not be in state of confusions, he will hold around two to three Postings and he will enjoy all benefits. Because of his posting and high powers his name and fame will spread worldwide and he will get the recognition from the people. He will hold a high command in his positing and he will be ruling a Nation or Country. This son as, he has born as a human being, now and he finds problems because of the movements in the planetary positions and he will be under the control of the planets. At present he is been influenced by 7 ½ years Saturn, so now and then he will find some disturbances. According to the Kotcharam the Saturn is housed in Libra. He will find obstacles in getting a good position in Politics, in the last moment he will find negative happenings. His efforts will meet with failure. He will be cheated by his trustworthy persons. He will find problems through his close associates. He will suffer from financial loss. He will be incurred by huge expenses. Some people will not like him to enter into Politics so they will criticize him. His party people will act against him and he will not be able to contest in the election. The ruling party will involve in back door works against him. Stigma will be attached to his name. He should have more protection in the Political field. He will find differences of opinion between him and his closer one. This son by performing the remedies strikes in his mind in the right time; he will find good changes. These predictions are studied around his earlier age of 42 this son has obtained the blessings of Lord Shiva and Parvathi Devi. He will know that the Grace and Blessings only will win this world. In future good happenings will take place. This son from now onwards he will get more political contacts. His party members will be spiritual oriented. Through his intelligence he will get gradually involved with his party men. He will be holding high responsibilities. His name and fame will spread far and wide in the field of Politics. Within two to three months i.e five months all the process will get completed. Initially he may find some problems and confusions in Political field. In future he will find desirable changes and the changes will be useful to him and he will find developments. Within one year there will be changes in the Ruling Party which will be favorable to him (from 4 July 2013 to 3 July 2014). He will have high involvement in Political field. He will be holding a high position equal to Sabha. He will be called by elderly persons in his party to form the Government. He wll find the developments in spirituality and it will show him the way to attain enlightenment. Nadi office of A. Sivasamy, S/o V.S. Arulsiva Arumugam, Vaitheeswaran Koil, Tamil Nadu, India, on 4 July 2013. Photo of Maha Shiva Nadi Political Chapter of Kalki written by Agastya Maharshi, read on 4 July 2013 from the Nadi office of A. Sivasamy, S/o V.S.Arul Siva Arumugam, Vaitheeswaran Koil, Tamil, India. Real Kalki Purana. Sage Vishvamitra said the recent past birth of Kalki was Swamy Vivekananda. Historical evidences from ancient Koushika Nadi Palm Leaves (Nadi Astrology). Ancient Koushika Nadi Palm Leaves gives the answer that this is the right time for the 10th Incarnation of Lord Vishnu. Vishvamitra is also known as Koushikan, the great Sage of the Indian history. Vishvamitra and other sages like Vasishta, Agastya etc. lived in the same period. Vishvamitra is one of the important sage of Sanathana Dharma or Hinduism. Vishvamitra was a King and later became great Sage. Here by giving important Aadi Tamil stanzas with English prose translation from Koushika Nadi Pothuvai Kandam (General Chapter) and Past Birth Chapter (Shanthi Kandam- 13th Chapter) of Kalki. Divine words of Visvamithra Maharshi. These Nadi palm leaves were read on 2nd November 2004 from the Nadi office of N. Sivaraja, Sri Agatya Maha Siva Nadi Jyothida Nilayam, No.18, Milladi Street, Vaitheeswaran Koil, Tamil Nadu, India. Ulahaneithum=in the world, Oozhkatri=solves the past birth sins, Kakkumayyan=Lord, who protects, Uyarvana=that in the highest position, Adipottri=showing respect, Makan Shanthi=past birth chapter of this son, Nalampirave=for goodness, Uraithiduvan=informs, Koushikan Yan=introduces himself as I am Koushikan, Yan=I am. Sage Koushikan was also known as Vishvamitra, offers prayers to Lord Shiva – the protector of the world from the sins of previous births. He then introduces Himself as I am Koushikan and reveals the divine secrecies of the world renowned past birth of Kalki as Swamy Vivekananda with all its importances in the Past Birth Chapter (13th Chapter -Shanthi Kandam). Kaushika said. Born on Tuesday, the 28th of Karthikai Month in the Virodhikrithu year as per Tamil calendar. 14 December 1971 in English calendar and 28 Vrishchikam 1147 in Malayalam calendar. Chothi (Swathi – 15th Lunar Asterism) is the birth star. Kaushika Maharshi said. The Son has great extra ordinary intelligence and efficiency. Kaushika Maharshi said. Balanivan=boy, Eentrorum=parents, Deerghamahe=are alive, Peshidave=while informing, kadaiseyaay=as the youngest son, Pirappusolla=born, Nallavarkku=he, Thunaiyanor=one brother, Thunayalappol=one sister, Nallvithamaay=as it is informed, Nilaimanamum=married, Kanduvazhvu=living. Parents are alive, while reading this Nadi Palm Leaves. Born as the youngest son. Two siblings, one elder brother and one elder sister, both of them are married. Kaushika Maharshi said. Vazhvufalam=excellent livelihood, Sheikalume Vithunaleeru=two siblings, Valamudane=with joy, Thaanmanam Kanaa=not married, Thuravi=divine person, Azhakanivan=he, Atmeekam=in spirituality, Vazhvukaalam=now living. He is divine person, unmarried and living in spirituality (saint). Kaushika said. While reading this Nadi Palm Leaves, He has own house (Kalkipuri) and temple (Kalkipuri Temple). Kaushika Maharshi said. The previous name Gopakumar and Akhilananda Swamy were changed and the present name is Kalki. Kaushika Maharshi said. Position: Dashamavatharam (10th Incarnation of Lord Vishnu). Kaushika Maharshi said. Generally, in Nadi Palm Leaves only one name is mentioned. But in this special and important Nadi Palm Leaves of Kalki, Lord Parameswaran Shivan establishes with historic evidences. The name Gopakumar given by parents is documented in the school certificate, the name Akhilananda swamy and Kalki are also documented in the Kerala Gazette (6th July 1999 and 11th Jan 2000 respectively). Later, these three names were proved historically in ancient Nadi Palm Leaves read in 2004 with the clarification of present name as Kalki. The two previous names of Kalki were real and not pet names, when used. Usually, people have pet names, but these are not official. Nadi Palm Leaves are found in bundles. In a bundle, there are details of about hundreds of people. Among those, the three names of Kalki which is found from His Nadi Palm leaves are the scientific proof to identify the original Nadi Palm Leaves. So, Nadi Palm Leaves of Kalki are not just a prediction, but the science to prove the history of incarnation, reincarnation, birth, rebirth and also the pre-planned executions of this Universe. Divyamaay Dashamattam Rishiyinashi=have the divine blessings of 18 siddhars (saints). Kalki have the divine blessings of 18 Siddhars (saints). Kaushika Maharshi said. KaanaMakan=son, Irai bhakthi=dedication to lord, Darshanamudan= divine vision, Kadainalum=till the end, Vazhvuvalam Pirarmicham=will have a prosperous life respected by others. Kalki has sincere dedication to Lord and is living in spirituality with prosperity and maturity. Kaushika Maharshi said. Mechidave=in good manner, Danadharmam=give free food, cloth, money etc. to the poor people, Palavumkand=will do many. Kalki will help the people. Kaushika Maharshi said. Menmaitharum=highest, Vak Siddhi=the highest official power to execute through words, Aaththisherkkai=will have plenty of wealth, Pesha Makan=this son, who is being informed, Kandalum=however, Sanyasivazhvu=living as a saint. Kalki has the great divine “VakSiddhi” (a specially alloted divine power by Lord, executed through the words and decision of Kalki). Kalki is saint (sanyasi). Kalki will have plenty of wealth. Kaushika Maharshi said. Nayakarkk=his, Kalkiye Ithulnaal Namam=present name: Kalki, Namam Mun Sakshiyodu Munsholli=informed the name in the beginning for evidence to identify this palm leaves. Kaushika Maharshi said. Presently, the name is Kalki. This is the evidence for identification of whose leaf is read, written in the Koushika Nadi 13th Chapter (past birth chapter) of Kalki. Kaushika Maharshi said. Nayakanum=he, Nularivan=while reading the Nadi palm leaves, Muppanshoolsar=aged 33. The age of Kalki is 33, when the leaf is read. Kaushika Maharshi said. These are the details of the present birth. Kaushika Maharshi said. The renowned past birth of Kalki was in Bengal (one of the state in India, previously known as Vanga Desam-), namely Vivekananda. Kaushika Maharshi said. Kaakshipadai=famous, Guru Guru Patniyum Eentror namam=the preceptor and wife of the preceptor (Sree Ramakrishna Paramahamsar and Sarada Devi) had the name of the parents (Ramakrishna and Sarada) of this birth. Kaushika Maharshi said. The name of Preceptor (Guru) and His wife (Guru Patni) in the past birth as Swamy Vivekananda are same as that of the parents in this birth. (Sree Ramakrishna Paramahamsar and Sarada Devi were Guru and Guru Patni and the parents in the present birth are Ramakrishna and Sarada. Thus the name is same. The word ‘Sree’ is used as salutation and Paramahamsa is not a name but it is considered as a spiritual stage. Here the word ‘Devi’ is used as an honourable salutation. Real Devi and Devan exist in Jyothirgolam or Jyothirmandalam like Lord Shivan and Parvathi Devi in Shiva loka, Lord Brahma and Saraswathi Devi in brahma loka and Lord Vishnu and Lakshmi Devi in Vishnu loka in the light form (Prakashaswaroopa). Kaushika Maharshi said. Saadhakanum=he, Ivvaraay=in this way, Vazhumkalam=while living, Kaalamathil =at that time, Nalmathippu Gauravankal=had good name and fame and higher position, Kaalayivan=he at that time, Ezhaikalkkum=to the poor people, Udavipalvar=helped, Nalamudane=with prosperity, Sheithume=did, Irainsevai=sincere service to the Lord, Nayakanum=he, Idaivittu Shentrathanaal=since went back without completing, Ithupirappum Akhilananda Swamy=became Akhilananda Swamy in this birth, Sadhakanum=he, Iraivazhiye=sincere service to Lord, Upadeshampalvar=gives spiritual advices, Vinnamila=not different, Kandiduvan=know that, Gopakumaru=Gopakumar. Vivekananda was a renowned saint. He helped the poor people. He had done many other divine services with temple works as a saint (Iraisevai). But He did not complete and returned. Kaushika Maharshi said. Therefore, Vivekananda came back again as Akhilananda Swamy in this birth – one of the previous name of Kalki which denotes Sanyasa (saint) and Gopakumar is not different (one of the previous name of Kalki), which all expresses that these two names Gopakumar and Akhilananda Swamy are the same part of the divine mission of Kalki. Presently, Kalki gives spiritual advices to the devotees. Kaushika Maharshi said. Uyarvuthadai=obstacles happened in attaining the higher positions, thadai=obstacles, Munpirappu=past birth, Silpapam=unimportant sins, Papamathum=these sins, Thanariya=without self knowledge, Kandathanaal=though had done. Though done without knowing, past birth sins are the reason for obstacles to get higher positions. Kaushika Maharshi said. Balakarkku=he Palarkakku=to save several people, Pirappukandaan=born for. Kalki is born to save people. Kaushika Maharshi said. Kaalaikku=he has, Malavanashi=the blessings of Lord Vishnu, Kadaimundu=till the end. Kalki has the blessings of Lord Vishnu. Kaushika Maharshi said. Vannamathaay=definitely, Makan=son, Guruvaay=as preceptor, Vazhuvallan=will execute everything efficiently without faults, Valamthane Sakala Saubhagyankal=will live with all fotunes, prosperity and diginity. Definitely, Kalki is living as a Preceptor (Sadguru) with all efficiency and prosperity. Kaushika Maharshi said. Makanivanum=this son, Thanithuvamum=with specialities, Thuraviyahi=is a divine person. Kalki is a divine person with much speciality. Kaushika Maharshi said. AahaMakan=son, Parpukazhe=with fame, Vazhvumshemmai=live with prosperity, Arulumshinthai=attains divine words and is in the path of wisdom. The son, Kalki, will live in spirituality and attain divine words with prosperity. Kaushika Maharshi said. Menmayathay Ekavazhvu Pirarpotru=will live a glorious lonely life praised by others. Kalki will live a glorious lonely life praised by others. Kaushika Maharshi said. Ayyamyethu=courageously, Eraiyodu Alaavumshakthi=will be able to get divine vision and to talk courageously to Lord, Sundeeramaay=beautiful, Thanvazhvu=own life, Thane Arivaan=for self knowledge, Shelvanukku=for him, Siddhar Aashi=blessings of 18 Siddars (Agastya Maharshi, Visvamithra Maharshi, Vasishta Maharshi etc. ), Shivan aashikalum=blessings of Lord Shivan, Avaniyile=in this earth, Ithupirappu=in this birth, Kadainalum=till the end, Peshittapadi=as informed, Vazhnthiduvan=for living, Daiva Arulal=by Lord’s blessings, Balakarkku=he, Iraishinthai Arulum Melum Mutre=will have the highest divine thoughts and divine words till the end. Kalki will be able to know His life by self with the blessings of Siddhars and Lord Shiva. Kalki has the blessings, divine wisdom and divine words from Lord till the end. Sage Kaushika informed. I happened to meet Kalki in the year 1991, from thereon I was in a deep research to understand Him and about His goal. In the path of understanding Him, Kalki has made me knew that He is the person who will reform the World. In 1998 Kalki made an official declaration in public that He is Kalki himself. In 2003 it is proved in astrology and in 2004 it is proved in Nadi Palm Leaves too.Nadi Palm Leaves is a scripted proof and visual proofs are yet to be staged. Video of my speech at International Vedic Seminar, Calcutta University Centenary Auditorium on 19 Jan 2014.